As an IT admin you like the control that LDAP gives you over servers and IT applications. Unfortunately, like most admins, you dislike the amount of time required to install, configure, and manage a full LDAP implementation. Add in cloud infrastructure and the complexity level increases significantly. Download this new guide to learn how moving to a Directory-as-a-Service provides innovative organizations tighter security, reduced expenses, and increased agility. 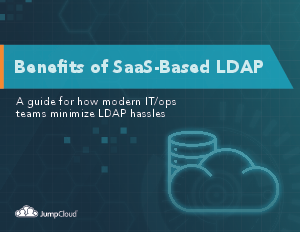 Don’t let the complexity of LDAP stop you from safely taking advantage of the cloud era. Get the knowledge you need to keep up with this quickly changing landscape.